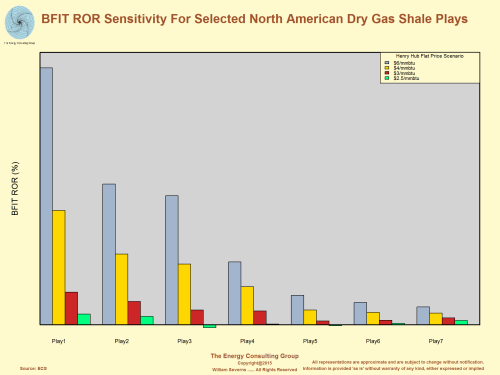 Deep Utica Dry Gas- Emergence of a "super" shale play. 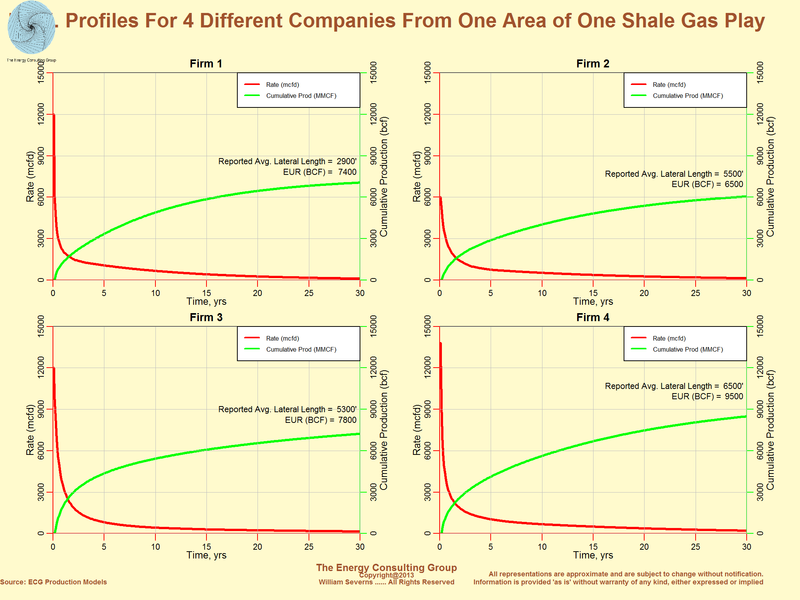 While oil and gas companies can and often do share generalized economic valuations with the public regarding economic returns associated with oil and gas investments, including the shales, the methodology and criteria usually varies from company to company, play to play, making an apples-to-apples comparison difficult. As demonstrated using the following graphs and maps, our approach normalizes the economics to one standard, which allows for useful comparisons and sensitivities across time, and between companies, technologies, and plays. 1) We call our base economic valuation tool EVAL, which is short for Economic Valuation Assessment Lens (EVAL). We use it for project economics and A&D valuations, and we view it as an easier-to-use, tuned for shales alternative to ARIES. 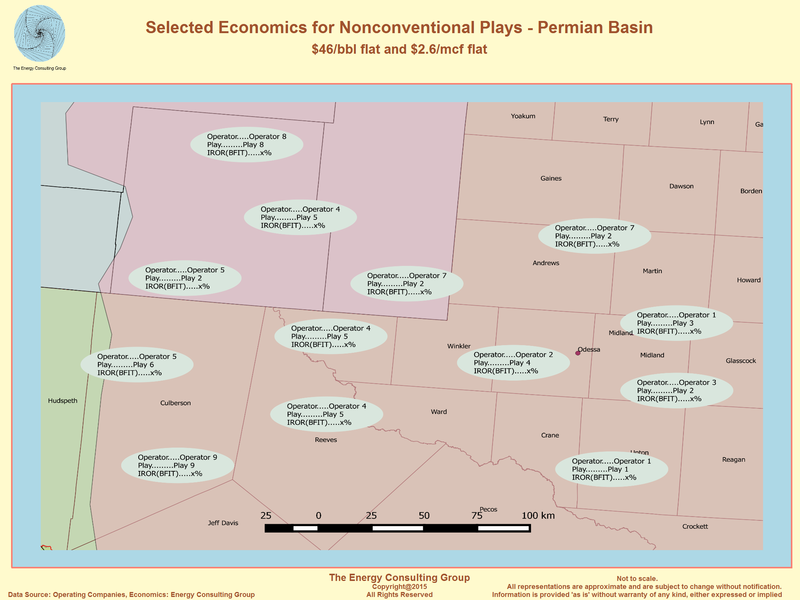 Among other features, it incorporates three product streams: oil, natural gas, and NGL's. 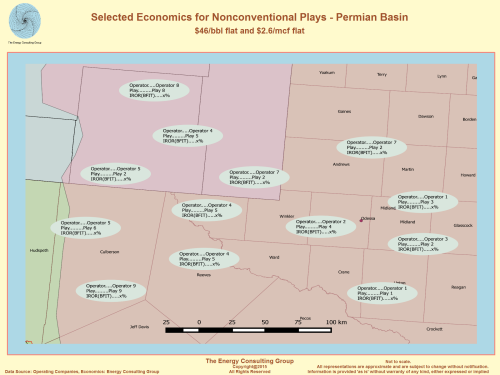 This capability allows us to develop, track and aggregate oil, natural gas and NGL revenue streams, as well as the associated CAPEX and OPEX for each product. The tool is also designed to allow assessments of both subsurface risk (e.g. geologic/reservoir), and surface risk (e.g. geopolitical, fiscal, etc.) to be incorporated into the analysis. (Note: the examples presented below are all unrisked.) The tool also gives us the ability to quickly assess economics at differing scales. For example, we can evaluate rates of return for individual wells, and in the case of that well being part of a larger program, we can easily scale up the assessment to the programmatic level to assess campaigns stretching across years, involving hundreds of wells and incorporating large associated facility build. 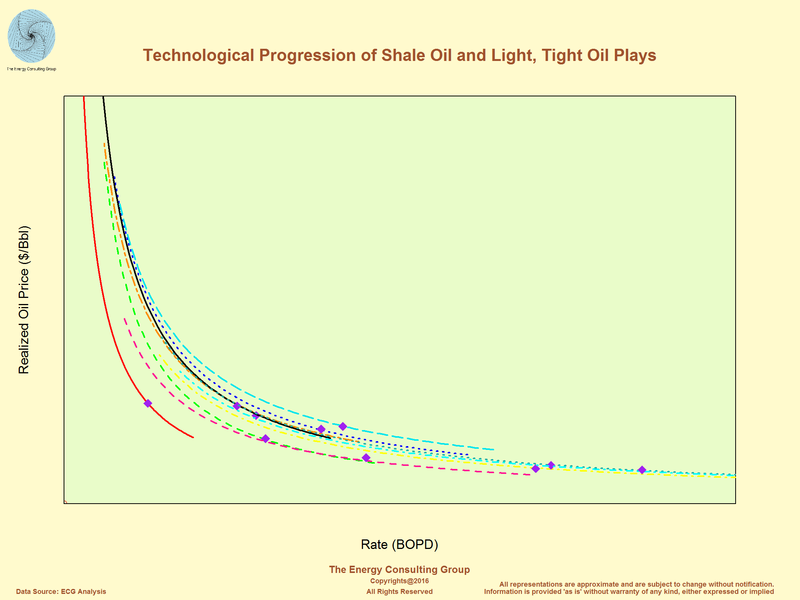 2) What we are trying to do in the analysis represented in the two following graphs, is to document the progress of new oil field technology over time and to assess its value. To keep the charts uncluttered, we have removed all the information regarding the state of the technology, the plays, and the timing. 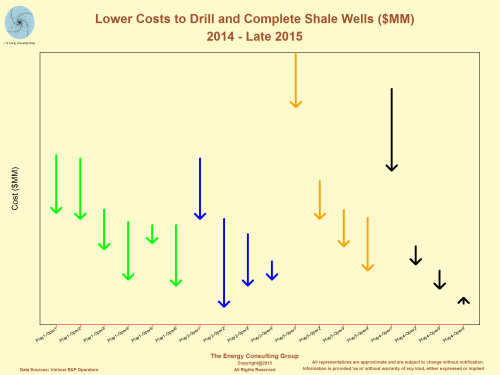 Still, even in their somewhat denuded state, we think them useful in showing three aspects of the shale revolution. First, the price at the average performance point (purple diamond) at which each iteration of the technology achieves economic breakeven is moving steadily lower as average well performance improves. Please note that the time frame ranges in years and that the vintage of the sensitivities becomes younger as one moves along the chart from left to right. Second, the lower performance tail (20% to 80% of the average) is economic at much lower prices as the technology improves. This means the percentage of the resource base that can reasonably expect to be developed is growing, implying the amount of oil and gas that can be developed at a reasonable price point has increased greatly. 3) Third, the obvious implication of the two points discussed to the left is that the price range at which a Nor Am shale boom would effectively cap an oil price rally is now much lower. In our opinion it is now in the $70-$80/bbl range, whereas, four years ago we believe it was in the $80-$100/bbl range. Aside from the pressure this places on OPEC, we think another often overlooked implication is that we believe this increases uncertainty for front end loaded, long capex cycle projects, such as deep water and heavy oil projects. 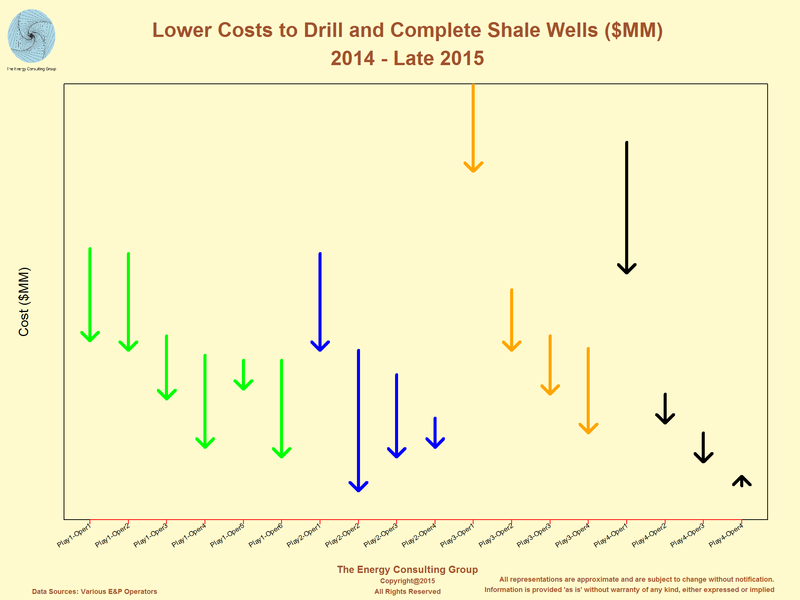 Our logic being that whenever the price gets high enough to justify the sanction of such projects, the ability of the shale producers to quickly ramp-up production to satisfy the market will likely push oil prices to sub-economic levels for the long cycle projects before they can start producing. This is not to say such projects will not get built. Of course some will, but in our view the economic uncertainty is going to increase, likely reducing their number and shifting justification rationales towards national priorities, company strategy, etc. Click on the image for higher resolution version of the image. Presented on the next three slides are examples of price sensitivities for selected oil, wet gas, and dry gas shale plays. The 21 plays or parts of plays are a fraction of the dozens of North American and international shale plays that we monitor. Click on the image for higher resolution version of the map. 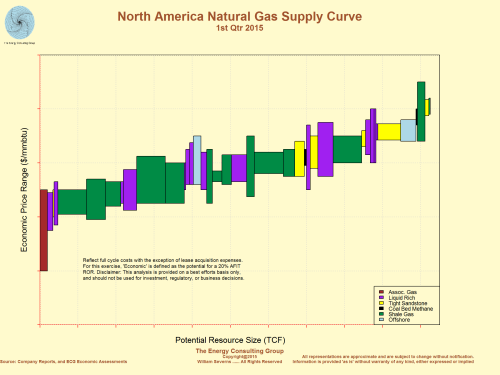 Supply Curve: Our North American natural gas supply curve has proved useful for predicting long term natural gas price trends. As we note here, we believe that short term natural gas prices are heavily influenced by current natural gas storage levels relative to demand and historical storage volumes. However, over the medium to long term it has been our experience that natural gas prices are primarily determined by the interplay of supply and demand. 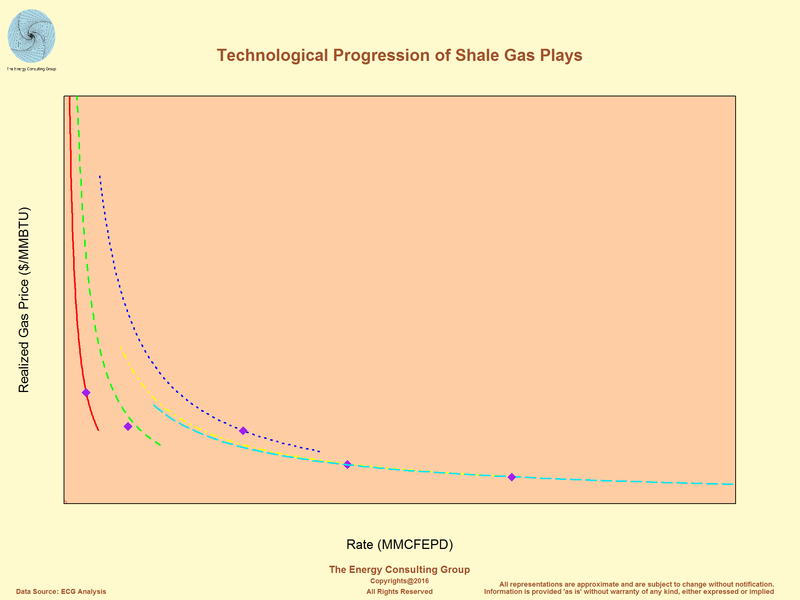 Note: the curve to the left is constructed by determining the approximate natural gas volumes associated with a play (the width of each rectangle), with the range of natural gas prices (the height) needed to economically develop those volumes. Consistency: The common frame of reference we apply to the supply curve economics is from the perspective of a firm which has already acquired the lease rights, but has yet to begin development activities. In practical terms, this means acreage acquisition costs are considered "sunk", and are not included in the cost basis of the economics. - North American E&P activity models, which have proved to be quite good for predicting such metrics as play level oil and gas rig counts, and fracing horsepower. 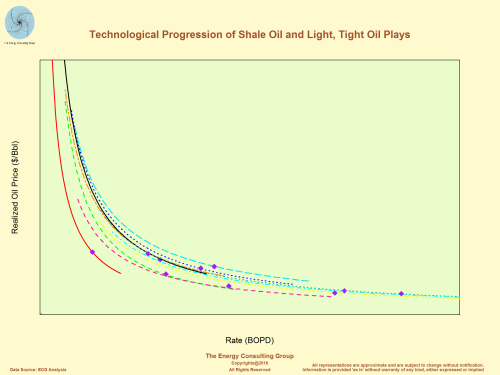 - Oil and gas supply curves - These have proved extremely useful in projecting oil and gas prices. Because of this importance, we take considerable effort to build and maintain our E&P cost database, which covers a wide variety of E&P project types, including deep and shallow water developments, EOR, and conventional and non-conventional activities. We must emphasize that it is not North American centric, but also covers Europe (North Sea), Middle East, South America, Asia, and Africa. 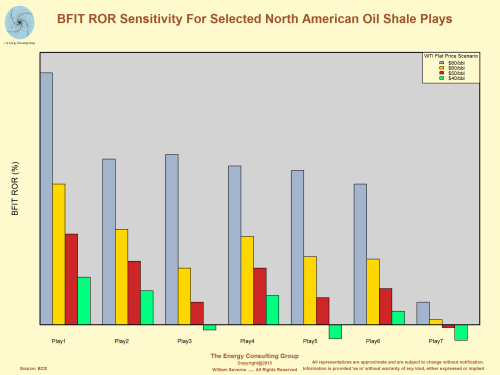 By its nature, it covers different operators in different parts of each of the primary shale plays, and extends back for over 10 years. Given that, we have a robust ability to quantify the pace and magnitude of learning curve effects, place a value on new technologies, and economically evaluate changes in drilling, completion and fracing practices. 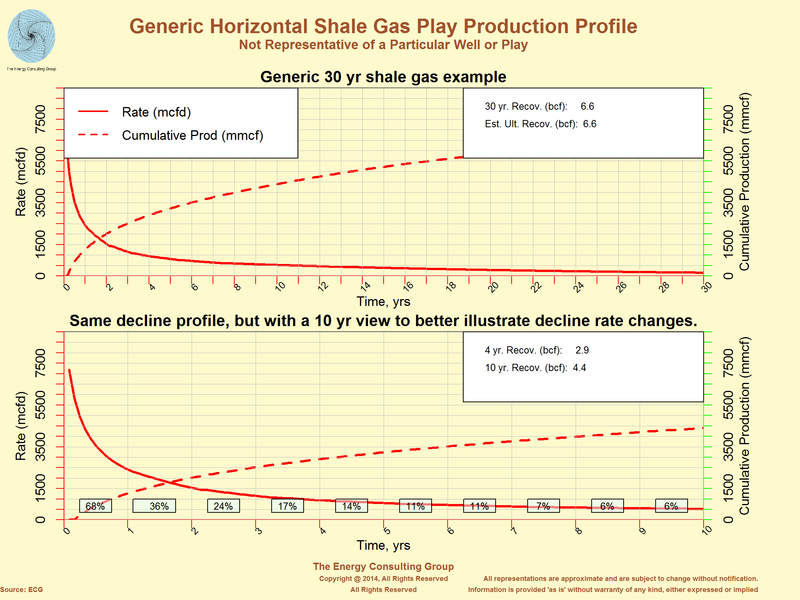 Production Forecasting: This slide and the next slide illustrate our proprietary capability for forecasting oil and gas rates. 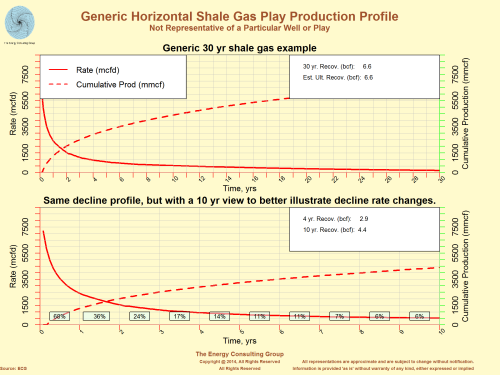 Though we do have the capability to model production rates and recoveries for shale plays using reservoir simulators, we tend to limit the use of such powerful, complicated tools to emerging plays, which have limited production histories. Another exception is to use the simulator to forecast the timing of major forward CAPEX expenditures in more mature plays, such as estimating amounts and timing of compression needs. For EOR projects we tend to use simulators because the complex reservoir physics make each project unique, and, therefore difficult to model using analogues. Click on the image for higher resolution version of the image. Technological Innovation: One example of the flexibility and versatility of these tools, is presented on the slide titled, "Four Different Production Profiles From One Area of One Shale Gas Play". 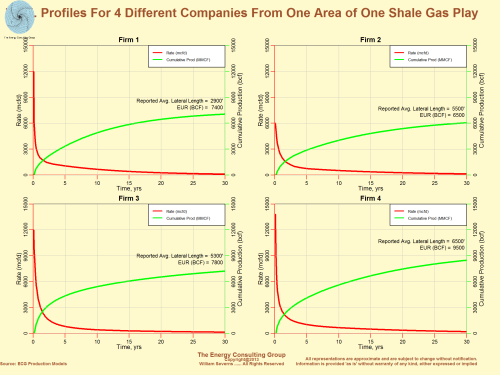 On this one slide are production results for four different companies in the same area of one shale gas play. 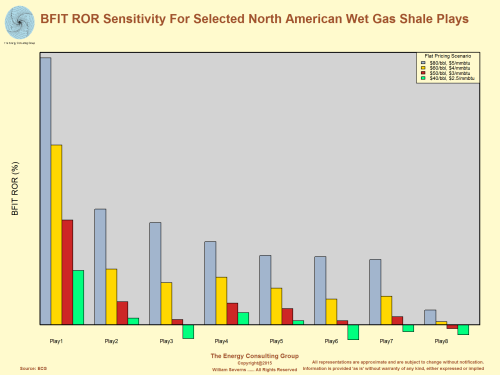 Each of these firms had a different approach to drilling and completing wells in this play. By comparing reported production results, we began to gain insights on not only the different economics experienced around the play, but also who were the more effective operators, and an early sense of how the technology was evolving, and which innovations were working, and, therefore, "winning".